He’s in town, says he has what we’ve been looking for. He’s out of control, Mike. You told me Bianca was not a problem anymore. 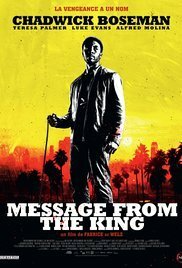 Those who imagine the Los Angeles metropolis to be idealistically beautiful, they should adjust that view after watching “Message from the King”. The less beautiful part of Los Angeles is used here. An impoverished neighborhood where the vast majority of residents live in poverty and where crime and drugs are an obvious part of society. Ash gray ghettos full of human suffering. And that’s being emphasized by drizzly weather. The crowded mortuary is a reflection of these fading slums. A collection of nobodies who died because of an overdose, madness (drowned in a bathtub as an imaginary fish) and gang violence. All you need is a bicycle chain. This is what Jacob King (Chadwick Boseman) faces when he arrives in L.A. The reason why he’s staying in the city of angels is the sudden disappearance of his younger sister Bianca (Sibongile Mlambo). Soon he discovers the sore situation his sister got herself into and what it did to her : she earned a spot in the mortuary with a name tag on her big toe. The search for the murderers of his younger sister brings him in touch with all kind of figures. Trish (Natalie Martinez) the loyal neighbor points him in the right direction after which he meets a violent gang of Balkan criminals run by a certain Zico (Lucan Melkonian). Then there’s the rich dentist Wentworth (Luke Evans) and the wealthy movie producer Preston (Alfred Molina). And let me tell you. Some of them are getting to know the bicycle chain he just bought, in a less pleasant way. For Jacob, these L.A. neighborhoods probably still look like charming neighborhoods compared to where he comes from. His sister Bianca, his deceased brother Isaac and Jacob himself, lived the largest part of their life in South Africa in the Cape Flat townships, a sandy area south of Cape Town and better known as “Apartheid’s dumping ground”. A dilapidated community where gangs rule. Both in the slums and in prison. Such as “The Number Gangs”. Isaac was a member of this notorious gang, until his death. Reason enough for Bianca to turn her back on her home country and to seek salvation in the United States. I’ll be damned. It’s directed by a Belgian. You could say this movie is a cheaper version of “The Equalizer” with Boseman having an equal personality as Denzel Washington. A cold-blooded but alert person who has control over his violent eruptions and who accurately follows the traces to solve the criminal puzzle in the end. However, the ultimate motive remains quite mysterious. Perhaps the only minus I could find in this hard-core, ultra-dark movie. In fact, it’s an ordinary revenge film that differs slightly from others because of its quirky atmosphere and tone. And afterwards I discovered the film was directed by a fellow countryman : Fabrice du Welz. Maybe that’s why this movie displays a kind of willfulness. Why hesitate? Go watch it! Even though this action-flick is soaked by cliché elements (corrupt policemen, a cunning politician and a prostitute (Teresa “Lights Out” Palmer) who plays the Good Samaritan), you can speak of a stylish end product. No explicit violence scenes (the result is usually more explicit than the action itself) and a few star-like interpretations like that of Teresa Palmer. But especially Chadwick Boseman impressed. A man with few words, but hard negotiating techniques. From the very first instance, I was fascinated by him. In my opinion, this is yet again a rough diamond that simmers on Netflix undiscovered. Don’t let anybody stop you from watching this when you bump into it somewhere, because this will surely surprise you.